CHARLOTTE, North Carolina, (AFP) - United States (US) President Barack Obama on Thursday implored Americans to grant him a second term to complete his battered crusade for change, warning of the starkest election choice in a generation. 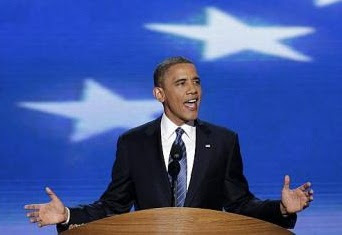 Four years after his historic election win, Mr Obama accepted the Democratic Party's nomination for a second time, dispensing hard truths on US economic ills and warning that Republican Mitt Romney would endanger America abroad. Sketching an agenda to create millions of jobs, cut US$4 trillion (S$4.9 trillion) from the deficit and bolster his nation's strength overseas, Mr Obama refused to abandon the hope of 2008, saying: "know this, America: our problems can be solved." "When you pick up that ballot to vote - you will face the clearest choice of any time in a generation," Mr Obama said, forecasting fateful choices looming on jobs and taxes and war and peace.